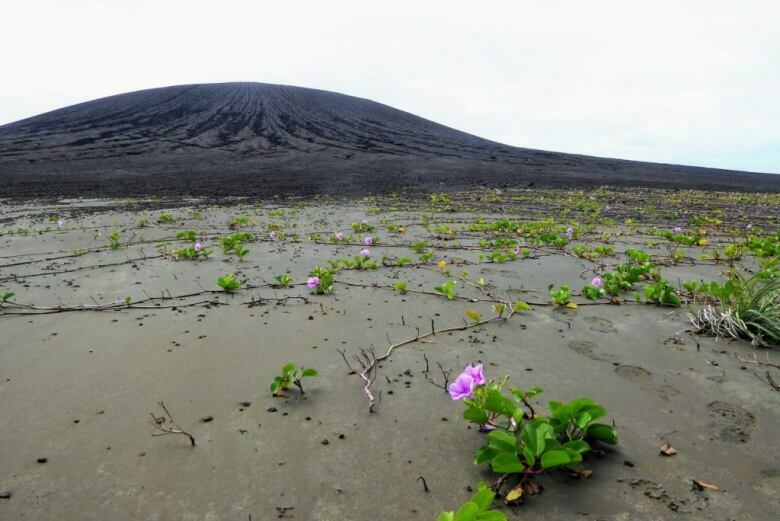 The tiny island of Hunga Tonga-Hunga Ha'apai, in the South Pacific, formed three years ago from settled ash and rock after a shallow water volcanic eruption. NASA researcher Dan Slayback recently got the chance to visit it. 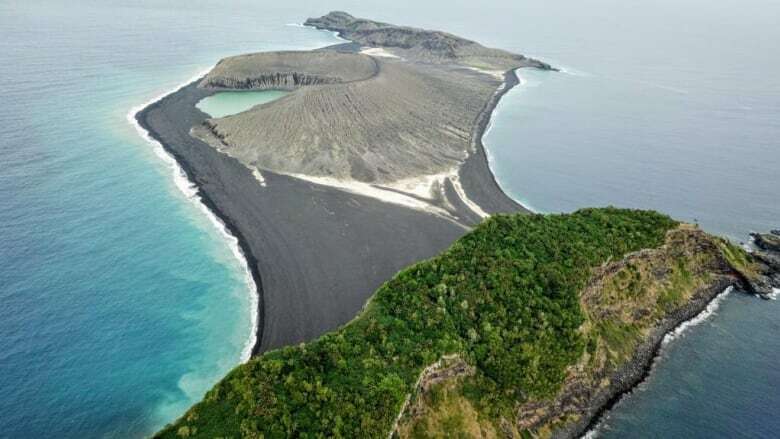 The tiny Tongan island of Hunga Tonga-Hunga Ha'apai was formed in 2015, from a mass of ash and rock that settled after a huge underwater volcanic eruption. Normally those kinds of volcanic islands are quickly swallowed by the sea — but this one seems intent on sticking it out. 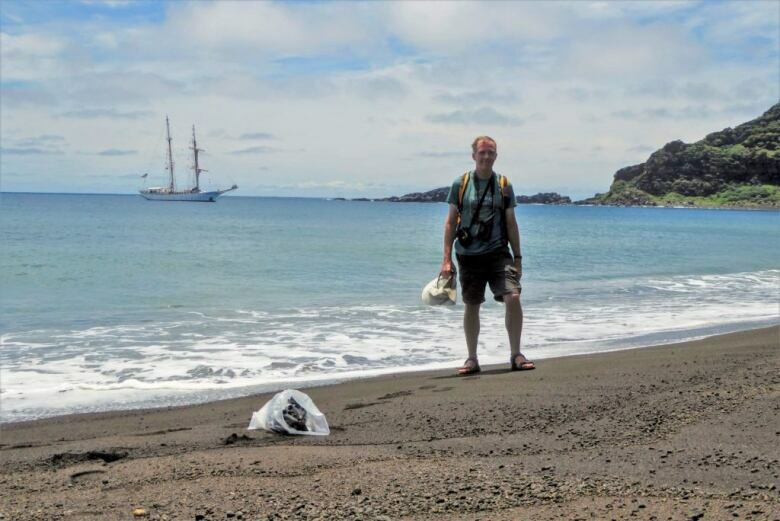 After looking at the little island through satellite images for years, Dan Slayback recently got the chance to visit it in person. Slayback is a research scientist at NASA's Goddard Space Flight Center. He spoke with As it Happens host Carol Off. Here is some of their conversation. Dan, what does it look like to be on this island? It's pretty stark. When you land, it's black sand — not quite sand, more like gravel beaches. So it's this kind of black-and-white landscape. But there are the older islands adjoining it. And one in particular has a rainforest on top of it. So there's this old island with dense greenery on it, adjacent to this black-and-white new landscape. You got to take some students there. Did you just get lucky? Did you win the lottery? I kind of won the lottery. The Sea Educational Association in Woods Hole, Mass., run these brigantine tall ships around the South Pacific with 20 or so university students, who are doing a six-week program looking at different scientific or cultural aspects. And they wanted to stop at the island because they'd heard about an eruption. They'd seen some of the stuff we'd put out a couple of years ago. And so they got in touch with us and invited one of us to come along to help show them around. There have been volcanic islands before. But they come and go pretty quickly, don't they? Typically, yes. This is a type of eruption called a Surtseyan eruption, where you have an eruption in shallow water. It forms a lot of ash because of the interaction with the sea water. And if it's small enough, it's unconsolidated ash, and that washes away quickly with the wave action. In this case, it appears to be big enough that there's some hydro-chemical alteration going on with the sea water and the heated ash. And that's causing it turn into a type of concrete. And that's probably what's maintained its structure for this long. We thought it would be gone in the first year. And now it's still there. So several decades, I would think. Unless there's some kind of major collapse. Any other kinds of life that have decided to inhabit this island? Yes. And that was also fairly surprising. 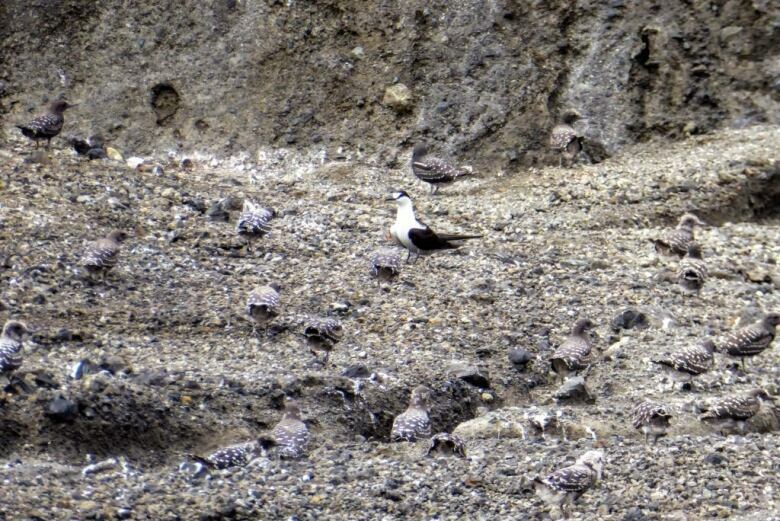 We found this patch of probably 30 metres across of varied vegetation, and a ton of birds nesting there — sooty terns. There were tons of chicks. It was pretty crazy. And the chicks couldn't fly, so as you walked by they were in a panic and a terror. So we tried not to go too close to where they were. But there were probably thousands of birds. It was really remarkable. It's quite dramatic-looking, isn't it, these rock formations? Yes, because you have these vertical cliffs that have heavily eroded, so they're deeply channeled. So there's a lot of change going on, of just erosion of the main cone downwards from rainfall, as well as from the wave action from the coast. And there's a crater lake in the middle of it. Before people get this feeling that some beautiful, pristine thing has been discovered untouched by Man, you also discovered garbage. There was a surprising amount of garbage, mostly in that crater lake. 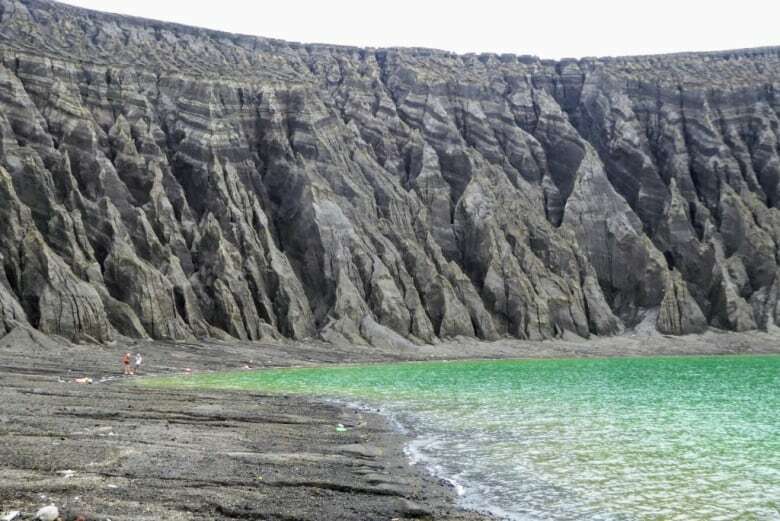 I think what happens in stormy weather, debris washes over the sand bar into the crater lake and never gets out again. It was mostly fishing floats, nets, and plastic bottles, of course, which you see everywhere. And the students on the boat were great. There were different teams doing different things on the island. And one team was the trash team. They went around and collected, I think, all the garbage — including a fridge door that had floated in. This also will hopefully give insight into not just our planet, but others. Yeah. They've seen on Mars similar structures that look like volcanic cones that have been partially eroded, presumably by water. It's another suggestion that there were large bodies of water on Mars at some point, and probably coincident with volcanic activity. This is kind of an analog to what we see on Mars, yet here, we can watch it evolve in real time. Maybe some day this will help inform what they do on Mars. At some point maybe some future mission will check out those features in more detail. And you'll be picking up trash there too, you know. Q&A edited for length and clarity. Interview with Dan Slayback produced by Allie Jaynes.